The doors of New College’s student-run café, Four Winds, officially opened last week, welcoming hungry patrons inside with a posh new look, forward-thinking updates and a brand new espresso machine. Consequently, the popular café’s normal lunchtime rush turned into a hectic lunchtime traffic jam, but the staff, lead by alum (‘12) and manager Kira Albiez, handled the swarm of people with ease. 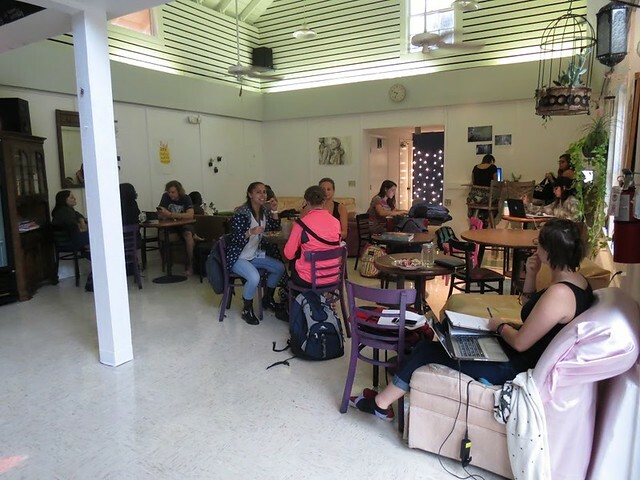 Under Albiez and co-managers thesis student Sophia Schultz and third-year Ava Howard, the Four Winds underwent four major changes this year, including redecoration, recycling and compost inside, a cheaper cash/credit food option and—yes—a new espresso machine. Simplicity was the theme for Four Winds’ redecoration, making the already perfect study spot more serene and open. Stepping foot inside the Four Winds and customers are greeted with clean white walls, satin upholstered couches, displayed student-art, a communal table near the front window, a de-cluttered counter in the back, a comfy couch on the raised platform outside and even stylish wallpaper in the all-gender bathroom. Created by Howard and thesis student Francisco Perez, the communal table allows for more seating in the café, particularly good for those who want to break out their laptop and get some work done over a nice cup of espresso. “I always like how the Four Winds is inside because it reflects the staff and the manager and the people. I like things a bit simpler and cleaner, so that’s what I was going for,” Albiez said. Albiez was originally worried that the simpler space would look too clean and sterile, but after doing some research on cafés, she couldn’t resist the blank walls with the wood and plant accents. Albiez also wanted to make the café a tad more formal to attract professors and community members to use the shared space as well. Four Winds’ recycling and compost is funded by the Green Fee, from which co-managers Howard and Schultz requested at the end of last year. Compostable to-go containers are on the way as well. Last year, alum (‘11) and former manager Olivia Levinson introduced a never-before seen change in the Four Winds. Citing Metz’s limited allocation to Four Winds as a reason, the café no longer accepted Ham points for any beverages in an attempt to preserve that allocation as long as possible. In 2014-2015, Four Winds’ allocation of Ham points depleted by February—last year, Ham points lasted until April. Albiez and co. carried over to this important change 2016-2017 academic year, also instigating a cheaper cash/credit food option on food to further preserve those Ham points. “I wanted to do that, so there’s a little more incentive for cash and card,” Albiez said about the cheaper cash/credit option for food, which is still being set up at the register. Lastly, a new espresso machine found its home in Four Winds, offering a tasty burst of caffeine to push the weary through their last assignments before class. Levinson sent out applications for the 2016-2017 Four Winds manager on April 19. All graduating students are permitted to apply for the position, but, traditionally, students who previously worked in the Four Winds are more appealing candidates. The Four Winds manager application is reviewed by the current manager and NCSA presidents. Candidates are interviewed and receive a decision thereafter. On May 8, Albiez sent applications for six open staff positions, left open by graduated thesis students. Four Winds is celebrating an important milestone this year: its twentieth anniversary. Before a café, the building was a barn from the Ringling era. In 1996, alum (‘97) Darilyn Avery’s ISP was outlining plans for a cafe on campus. Those involved with the ISP later brought the plans to the Capital Improvement Trust Allocations Committee, from whom they were granted $90,000 for the project. Twenty years later, and the Four Winds is the integral part on campus it is today, serving important vegetarian and vegan food options, hosting student-professor meetings, advertising student performances, opening late night during midterms and finals—all on the academic side of campus.